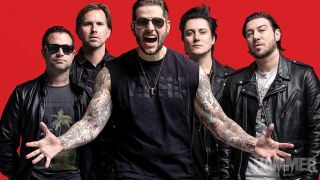 Avenged Sevenfold frontman M Shadows says he thinks their 2016 album The Stage will stand the test of time and could go on to become a fan favourite. The US outfit took everyone by surprise when they sneaked released the record in October that year, with the band continuing to add songs to the follow-up to 2013’s Hail To The King since then. And in the brand new issue of Metal Hammer magazine, Shadows has looked back on the record’s release. He says: “I think it will stand the test of time in terms of Avenged’s legacy and I think that at some point it will be a lot of people’s favourite record. “I just think that when you’re in the middle of the process of writing a record and you know that things are going to be a little complex or a little over people’s heads, then you’ve got to know that a backlash is coming. And it did. He adds: “I feel that all of the initial backlashes that we’ve had, people have grown into it. They try it on and see how it fits. “The backlash to City Of Evil was insane – and then the next one was insane because it wasn’t City Of Evil. The next one was actually fine because Jimmy had died. We didn’t get much of a backlash because I think that people felt bad for us. But then when Hail To The King came out, there was a huge backlash. Avenged are the cover stars in the new issue of Metal Hammer, which is on sale now and comes with a world-exclusive tribute CD to the band, with artists including Fozzy and Upon A Burning Body covering their tracks. The magazine also features Ozzy Osbourne, Five Finger Death Punch, Abbath, Lamb Of God’s Randy Blythe, Tesseract, Bad Wolves, Code Orange and more!